The Brittany BY630 is a French inspired whirlpool bath tub for two people. The spacious BY630 also features flowing armrests, lower lumbar support and jets at both ends of the tub for simultaneous back and foot massage. Call 800-720-1062 for more details. 36" x 72" x 0"
This tub is large enough for 2 people. Jason Whirlpool baths deliver a deep, invigorating massage focused on specific areas of your body. All Jason Whirlpools are constructed standard with color-coordinated Perfect Pressure/Perfect Flow™ fully-adjustable jets and one adjustable Ultrassage™ back jet. Select models are available with Back-Stack™ jet technology. STANDARD EDITION: Includes 1.5 HP , 1-speed pump and touch control with low water level sensor and 20-minute timer. Light indicates when pump is on. SIGNATURE EDITION: Includes 1.5 HP, 3-speed pump, digital control with low water level and water temperature sensors, 20-minute timer, automatic 1.5 KW heater and a LED mood light. Bath Controller operates bath pump and mood light. Shows water temperature and time remaining. Floating Universal Remote Control. This tub is available as a whirlpool. This tub is available as a combination whirlpool/air tub. Jason provides combination Air-Whirlpool baths. 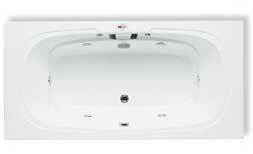 What is an Air-Whirlpool bath? It's the ultimate choice in hydrotherapy experiences. It does as little or as much as you want. It is the combination of Soaking, AirMasseur, and Whirlpool hydrotherapies into one vessel. You can choose to enjoy one type of hydrotherapy at a time, or run them all at the same time. It delivers the highest degree of relaxation and the best opportunity for therapeutic benefits. It is the optimum bathing solution to promote a healthy lifestyle.